These ain't your regular ponies. If I'm going to tell you my adventure of my life — explain how I got to this place with these people, and why I did what I'm going to do next — I should probably start by explaining a little bit about PipBucks. 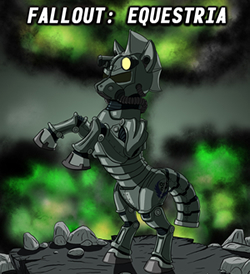 Fallout: Equestria is a Fusion Fic between My Little Pony: Friendship Is Magic and the Fallout universe. Stable 2 is an okay place to live, for most ponies at least. Littlepip, on the other hoof, is a rather underwhelming pip-buck repair pony, and is stuck in the monotony of one of the lowest ranking jobs in the Stable when she must leave in search of Velvet Remedy, the Stable's singer idol. Outside, she must learn to survive in a blasted, poisoned land... And possibly, with the aid of friends made along the way, bring new light into the darkness of the Equestrian Wasteland. The story is enormously popular and has inspired hundreds of side stories, including Project Horizons, Pink Eyes, Heroes, and Murky Number Seven, which have their own articles on this wiki. More information, including other side stories and art, can be found on its fansite . "In a world filled with misery and uncertainty, it is a great comfort to know that, in the end, there is a light in darkness."